Have you always loved wicker baskets and have always dreamed about receiving a hamper gift? However, you have this idea that they are really expensive. Well here is a list of some gift hampers that I’d love to send (and receive!). Gift hampers that seem afforable, as well as quirky and lovely. Here are 10 gift hampers with something for everyone. Not actually a hamper but a Percy Pig gift bag from M&S and let’s face it – we all love Percy Pigs don’t we? This Retro Tuck Box selection of sweeties has something for everyone. My daughter adores Double Dips but there is no way she’s getting her hands on my Kola Cubes! 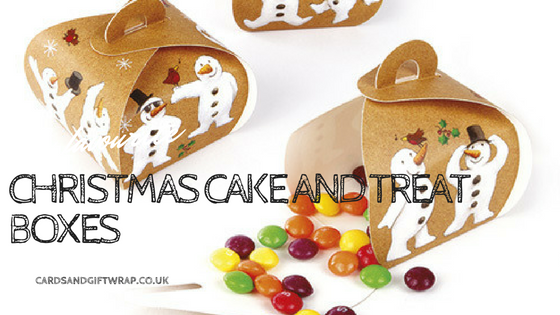 Hampergifts.co.uk have some other amazing hamper combinations too, worth checking out. There are lots of chocolate hampers on the market but this one from Cadbury Gifts Direct caught my eye because it was aimed at work teams. I’m all in favour of boosting morale in the workplace. I think gifts to the ‘team’ like this are a great idea for Christmas, or any other occasion for that matter. I did have a look at wine hampers but couldn’t choose between them and as I was looking at them and picnic hampers I saw this Amethyst hamper – it’s purple, what more do I need to say!? This was a difficult choice – as you can imagine there are loads of food hampers out there but I plumped for the Breakfast Hamper. Don’t you think it looks versatile and could be sent just as a gift. It suits a wedding, anniversary, birth of a grandchild or just for a special couple. To be honest I just can’t resist smoked salmon! No list of gift hampers would be complete without a Fortnum & Mason choice and yes, I have to be honest most of them are way out of my price range. However, I couldn’t help but notice one that was a bit different. How cool to have a Halloween Hamper delivered to the host of a Halloween party? Nice touch I think. I like cake, I also like cookies so imagine my delight to find a hamper that contains cake and cookies and flapjacks! This is another choice from Hampergifts.co.uk and I think an affordable choice too. 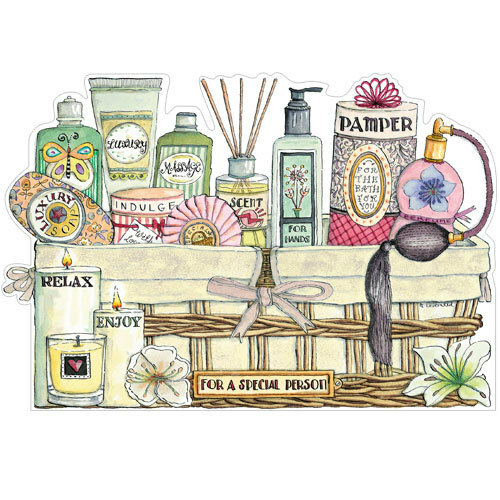 I think the Heather and Honey Hamper from Virginia Hayward is a pamper hamper that would suit most people’s tastes. It’s affordable and subtle and contains products that anyone would use. As a mother of small children I’ve heard of Toucan boxes but I didn’t realise that you can actually get Mister Maker boxes. Not quite hampers but a great idea. How often do you watch Mister Maker with your children and think how great the activities are? But you don’t have a wall filled with endless craft supplies and therefore don’t have all the bits and pieces you need to make his makes. Well, now you can. A great idea for busy parents who want to encourage their little ones creativity. This wicker basket from Hobbycraft is perfect for filling with your recipient’s favourite foodstuffs – or how about, while you’re at Hobbycraft anyway, a craft hamper? Does your recipient love card making, scrap booking, button pictures, painting, baking – it’s all there to fill your basket. You might also like Christmas Eve Boxes. With a glut of British strawberries this summer we’ve taken great delight in having an ‘excuse’ to support local strawberry farmers and go ‘pick your own’ing. Well, with me, hubby and three children able to pick (the 3 month old is probably just too young…next year for him)…you can imagine that of course we came home with more than we needed. Pancakes made topped with strawberries and devoured, cupcakes made and decorated with strawberries and devoured and generally a couple more punnets just devoured I was left with a couple of punnets that were left over and not going to last too long I decided to bottle some. It’s something we’ve done before, really simple and they lasted well in the bottles. Great to have British strawberries in the winter long after the season is finished. There are different ways to do this but either way you need an equal weight of sugar and water to make a syrup, sterilised jars and strawberries. That’s it! Method 1 – Bring sugar and water to the boil for about 5 minutes, make sure the sugar has dissolved. Add the strawberries and simmer for about 10 minutes until soft. 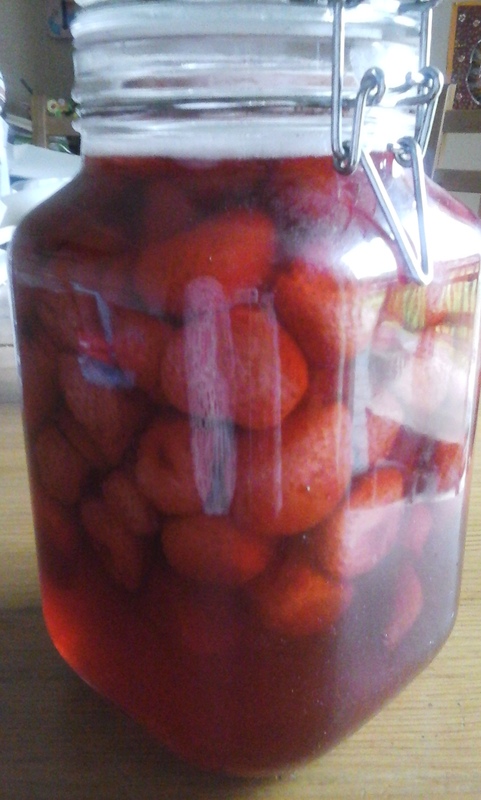 Put the strawberries in the pre-sterilised bottle/jar and cover with syrup. Seal and leave to cool. Method 2 – Pack warmed jars with fruit and cover with syrup solution (as above with sugar dissolved) Leave jars/bottles with lids but not closed/sealed in the oven at 150 degrees C for about an hour. (You can pre-sterilise jars/bottles by putting them in the oven at about 120-150 degrees C for 10 minutes before hand – no need to do this with method 2 but better if the jars are warmed before you put the fruit in or they might crack when you add the warm/boiling syrup). When eating don’t throw the syrup away! Either spoon over a pudding (ice cream is great), put in a glass and top up with fizzy water for a lovely drink or use some gelatine and make into strawberry jelly. I’m guessing if you boiled it up you could get it to set as there is probably enough natural pectin but I’ve never tried this. Would love to know if anyone has tried this. The fruit does rise to the top but that’s normal. If you liked this – you might like to make waffles to go with your strawberries. One of my children doesn’t eat much in the way of eggs and I think they’re a great food so quite often we have waffles for breakfast. 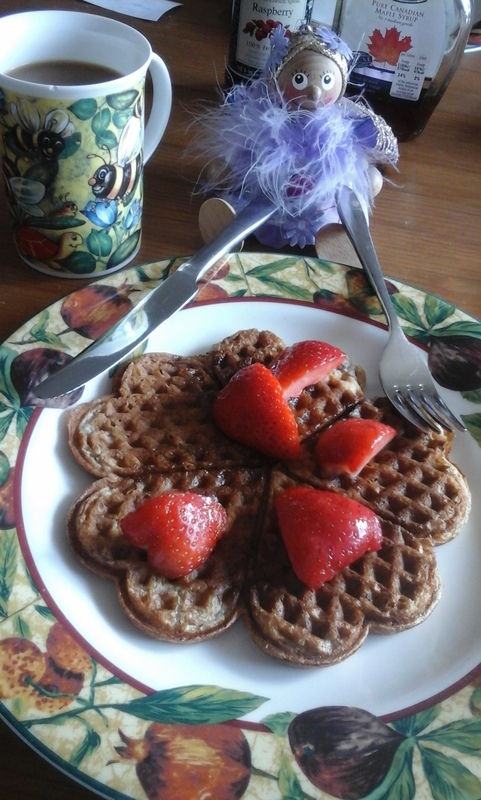 Take very little time to make in the waffle maker, doesn’t even matter if the batter is lumpy. 1 – Mix eggs, milk, butter, syrup together in a large bowl until well combined. 2 – Whisk in cinnamon, flour, baking powder and salt- don’t need to be completely smooth, a few lumps are fine. 3 – Pour just under a ladle full of batter on your waffle maker (actual amount will obviously depend on the size of your maker – trial and error, you’ll soon know how much to use). 4 – Cook as per waffle maker instructions, a couple of minutes each usually. 5 – If you can keep them warm till all are made – impossible in our house, little fingers grab them off the plate as soon as they’re made. Serve with fresh fruit and maple syrup! As you can see, Phlicity, my Flamingo fairy helper enjoyed them! My daughters have been having healthy week at school the past week. With much excitement my oldest came home on the first day saying, ‘Mum, do you want me to make you a mud cake?’…well that’s what I thought she said – turns out she was actually saying ‘mug cake’. 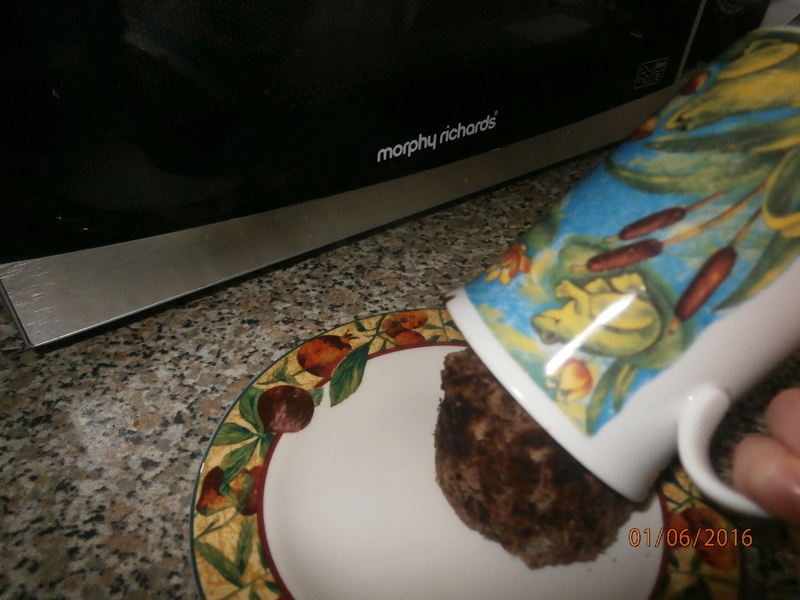 So later on when she was speaking to her granny on the phone all I could hear was ‘no, mug cake’….’mugggg cake, granny’…..’MUGGGG’…….’cake in a MUGGGG’…! She’s been making them all week. Three ingredients and no sugar! Just cocoa powder, banana and egg. This particular daughter will only eat eggs if they’re in a pancake or a cake so this is another great way to get an egg in to her now and then. Later in the week she asked if I could share her new recipe with you all…turns out she’s up-ed it to 4 ingredients with the addition of grapes. Personally I suggest you stick with the original 3 but it’s up to you. Lately I’ve been trying to cut out white flour and refined sugar almost entirely. It’s not easy when I’m nearly 8 months pregnant and craving chocolate, cake, crisps, biscuits, sweets….constantly. So I’ve had to find a few ‘sweet’ alternatives. 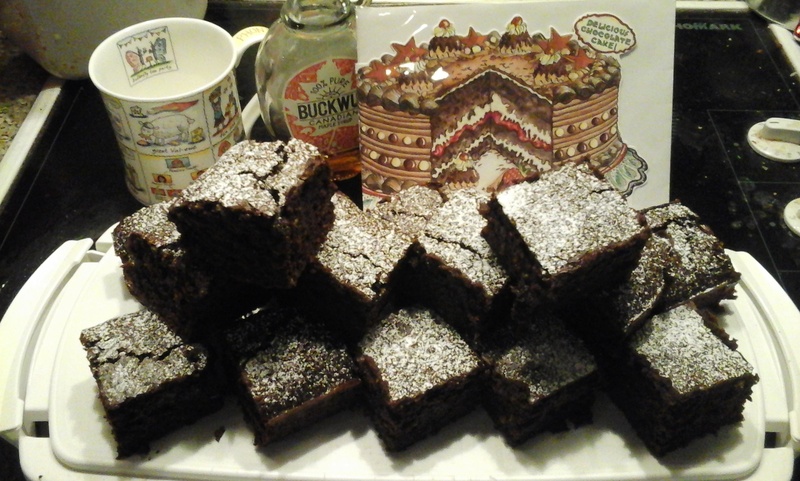 I found this recipe for sugar-free brownies online by Davina McCall. As usual I didn’t quite have all the ingredients to hand and I’ll tell you what I did differently, but essentially the were the same. I would love to try them again and make them gluten free too – maybe tomorrow! ?…and yes I did sprinkle a little icing sugar on the top but only a little and wouldn’t have if I wasn’t showing them to you! Chocolate – I only had 50% chocolate to hand but would like to try again with darker, my 50% was dairy free though. Milk – I use oat milk as we’re dairy free, it’s great for baking. Butter – as we’re dairy free I use Pure sunflower spread in all my baking, it’s perfect, you wouldn’t know the difference – unless you need a ‘buttery’ taste. Honey – didn’t have much honey left in the cupboard so made up with maple syrup, obviously made it a bit more expensive but yummy! Spelt flour – didn’t have spelt flour in the cupboard so used ordinary wholemeal flour, figured it was better than white. Grease a 30cm x 20cm brownie tin and line it with baking parchment. Leave the paper sticking up at the sides to make it easier to lift the brownie out when it’s cooked. Put the chocolate, milk, butter, honey, maple syrup and vanilla seeds in a saucepan. Warm over a very gentle heat, stirring regularly, until everything has melted and you have a rich, glossy – looking batter. Remove the pan from the heat and whisk in the cocoa powder. Allow the mixture to cool for a couple of minutes and then beat in the eggs. Finally add the flour and baking powder. The mixture at this point will look grainier than usual because of the texture of the flour. This is the first time I’ve made brownies and cooked them perfectly – usually they’re either too soggy in the middle or too hard on the outside because I’ve been paranoid they weren’t cooked right – these were just perfect. I would try them again with spelt flour, or with gluten free flour, or maybe just with ground almonds instead and definitely with darker chocolate and possible dark chocolate chips – or just chunks! PS If you liked this recipe then you’ll love coconut oil chocolate fudge! PPS I am a little obsessed with cake, that’s why I became a Flamingo Partner – cos eating cake is part of the job! This recipe is completely vegan and completely delicious (just cause it’s vegan doesn’t mean it’s not delicious!). 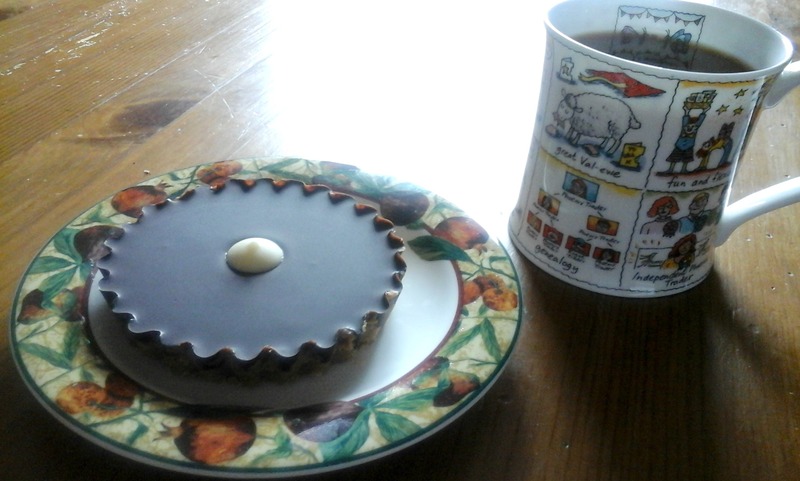 It has a mellowness from the coconut milk and a tartness from the orange juice taste. It’s also very healthy for you. The ginger and orange zest livens the pudding and makes it a memorable experience. You can eat this as dessert, breakfast or even as a snack. The pudding is fresh and pungent. In a sauce-pan mix the coconut milk, water, orange juice, vanilla extract, salt, and rice. Put the pan over a medium heat. Bring the mixture to the boil and then turn the heat down so that it comes to a simmer. Slightly cover the pan leaving a small space for the steam to escape. Stir the rice every 5 minutes so that it doesn’t stick and burn. Simmer for about 30 minutes or until most of the liquid has been absorbed by the rice. Once most of the liquid has been absorbed turn the heat off and place the lid over the pan. Let the cooked rice sit for about 5 minutes. Mix the honey, cinnamon, ginger, and orange zest in a bowl (leave a little ginger and orange zest for the garnish). Pour this mixture over the rice and mix gently with a fork. 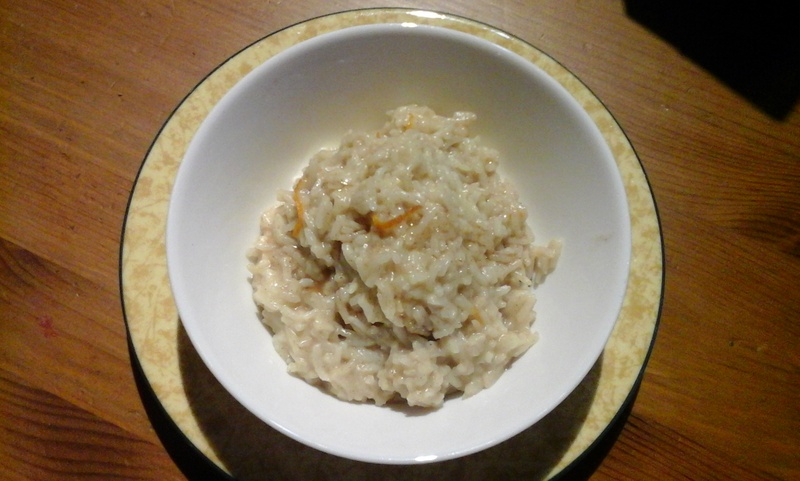 via “Coconut and orange scented rice pudding” Recipe. I took this to a coffee and cards and told everyone it was a lime cake, not a courgette cake, it was very strongly lime flavoured. 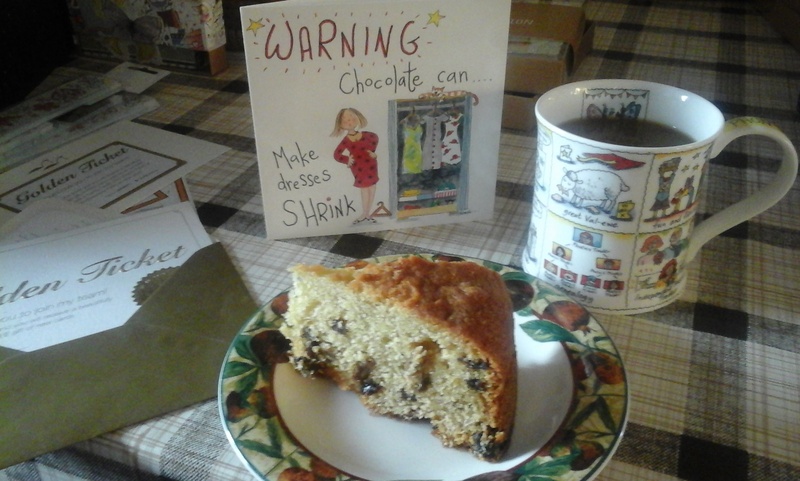 It makes a lovely moist sponge and with the lime was quite ‘refreshing’ according to one taster. The original recipe for this lime and courgette cake comes from Nigella Lawson’s book ‘How to be a Domestic Goddess’…but as usual I modified it quite a bit! There are reasons why I modified it but they all hinged around making this a dairy free cake. That meant I didn’t try and do a cream cheese icing on top (dairy free cream cheese is, in my opinion, just yuk, though with plenty lime it might have been ok I didn’t want to risk it). Then there was supposed to be a lime or lemon curd filling and as I didn’t have the time or energy to make my own I shop bought one, only to realise seconds before putting it on that it contained butter, if I had made my own I could have made it dairy-free. Wipe the courgettes, don’t peel them and grate but not too finely as they can go a bit soggy. I squeezed out some of the excess juice before I added them but you can decide how squishy they are. Put the eggs, oil and sugar together in a bowl and beat with a hand mixer until creamy. Sieve in the flour, baking powder and soda and beat again until well combined. Stir in the courgette, pour mixture into tins and bake for 30 minutes. They should be slightly golden and firm to the touch. Leave in tins for about 10 minutes then cool on a rack. Spread the marmalade over the bottom layer. Stack the second layer on top and cover with the dairy-free ‘buttercream’ icing. 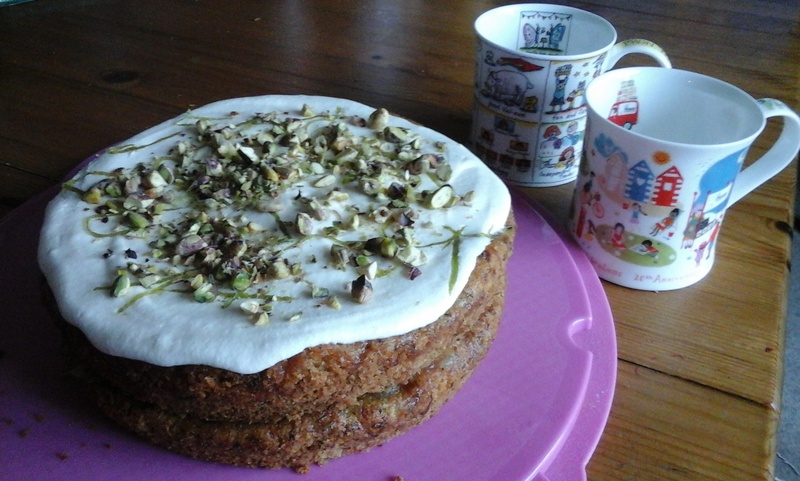 Sprinkle with lime zest curls and pistachios just before serving (best to allow the buttercream to set a little first). Update August 2018, I can now get an Oatly dairy free creme fraiche which I think could be used to make an alternative topping with lime juice and some icing sugar. Haven’t tried it yet but confident it would work.